With only 1 game to play on day two of the tournament we scheduled a shooting session at prior to the game at the tournament training facility (an indoor sports venue converted to a basketball court right next door to the main stadium). This allowed the boys more time to find their legs from their travel, which definitely appeared to pay off as we had a strong start to game 3. 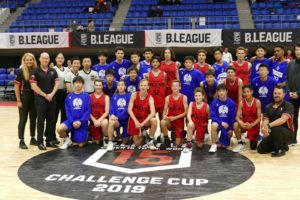 Playing the Toyotsu Nagoya team presented an opportunity to be on the floor competing against three U16 Japan Nation team members, an exciting challenge for our Eltham boys. The lead changed many times throughout the game as Felix Bell, Mitch Ferronato, Cameron Meyers, Jed Wallace, Kristian Ferronato and Nathan Raphael were all working hard to gain control of boards. The constant aggressive defence of the Japanese players continued to challenge our boys, but our guards started to look more comfortable with Emett Wise’s creative flair in full display and Ethan Reytomas and Isaiah Stratford both displaying composure as they created for others. As we entered the last quarter Kristian Ferronato’s leadership and the composure of Jed Wallace shone through, as we secured our first win of the tournament. This was our first win against a Japanese team and our first win on international soil. The significance of this didn’t get missed as the team and supporters all came together to enjoy the moment in our changerooms post game. We were all very proud of the boys. Seoul SK Knights were the Korean U15 Champions in 2018. They displayed great comradery and brought a lot of energy to every game of the tournament. Both teams started cautiously appearing to feel each other out. I think partly due to the fact we had an Korean speaking team from Seoul, an English speaking team from Melbourne and Japanese speaking officials………still can’t believe our kids are kids are only 12,13 and 14 and are getting to experience this! It was our defence in the second quarter that turned the game as we kept Korea to just 5 points taking a comfortable lead into the second half. We had good contribution rights across the team in the game, with Hudson Young, Emett Wise and Nathan Raphael all have strong games. Hudson Young in particular was playing hard at both end of the floor. With big smiles the boys ticked the box of getting a win against a team from both of the other nations attending the event. For our final game of the we were scheduled to play a very deep and talented Tochiga Brex team. This was always going to be a good challenge for our boys, who heading into this game had been able to square the ledger for the tournament up to that point with a 2 wins and 2 losses record. Although we had Jed Wallace, Isaiah Stratford and Nathan Raphael all connect from long range, the Tochiga Brex shooting was next level, connecting as a team on 13 three point shots for the game. At this point is probably worth mentioning that the Japanese team model, has the team (squad of approx. 15) training together for 6 hours a week and playing in a tournament every two months (they do one practice match between tournament). This created some good discussion amongst us as a coaching staff regarding the value of practice hours vs. competitive games. Our translators informed us that the Japanese coaches were very surprised to hear we played so many games. Unfortunately at half time in this game Emett Wise was unable to continue, as he received a heavy knock to his head late in the second. Emett was taken to a hospital in Tachikawa, where after undergoing testing had to stay in overnight before being released from hospital the next day. Emett’s talented playmaking was definitely missed in the second half but even more was his personality and presence amongst the group. Everyone was very happy to hear Emett was ok. The game was played in great spirits by both team but they proved too strong. We finished the tournament with a 2 wins and 3 losses record. The tournament officials awarded an MVP award for each team in tournament. This award went to Kristian Ferronato for the Eltham Wildcats. The was definitely well deserved as he consistently proved to be handful for these Japanese teams, with his ability to match the skills and physicality of our opposition. Kristian is a special talent and is definitely one of our exciting prospects for basketball in Australia. At the closing ceremony we were given the opportunity speak with the use of translators. 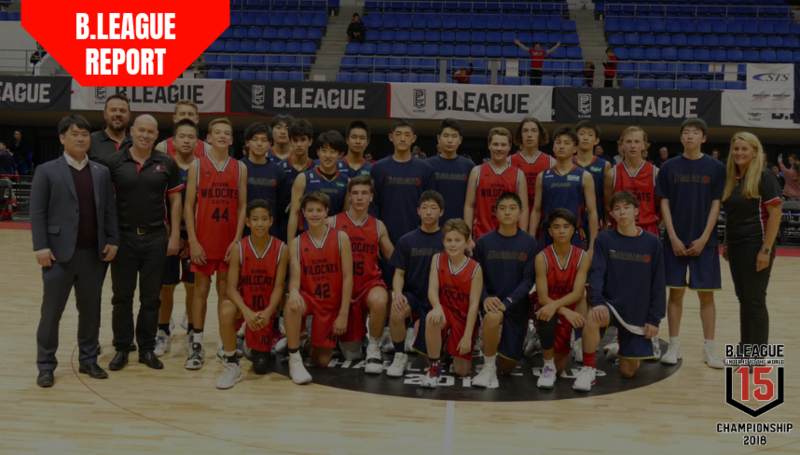 We used this opportunity to share our appreciation of the amazing hospitality we were shown by the Japanese B League and thanked all of the players, officials and administrators involved in this special tournament. This is the first time any international teams have ever been invited to this tournament and we were obviously extremely grateful to one of those two teams. At our post tournament family dinner we also had the chance to more personally thank our two Japanese B League ambassadors, both Take and Kohei were great to us throughout our stay. With sport you have an opportunity to meet so many different people, in these two individuals we have definitely met two of the good ones. They were impressive in all of their interactions with the kids, our coaching staff and our families. We presented them with some Eltham Wildcat apparel as a way of showing our appreciation. – the beautiful Japanese Culture, if it’s not on your destination list – add it! – language barrier’s don’t exist when people genuinely seek positive interactions. The kids were so much fun to watch, with their smiles, bowing and fives. They even learnt first names. – the respect and discipline the Japanese athletes bring to basketball is next level. This is obviously evident in the ratio of training hours to game time, but it more than that. They have this great ability to just switch to the next play! They bow as a team before stepping onto the court to warm up, before the game starts and then again on completion. There is no negative interactions between the players and officials at all. – plenty of basketball specific learnings – use of zero step rule, there strength and control over the ball, constant movement off the ball and their effectiveness using on ball actions. We thank everyone involved in providing our team with this opportunity. It is definitely one that is greatly appreciated. Thank you to the families that all travelled to share this experience with their kids and all of the other families. We will have this shared experience for life! Lastly a big thankyou to Rachel Wallace and Stuart Young who have been amazing people to coach this group of boys with over the past 18 months. 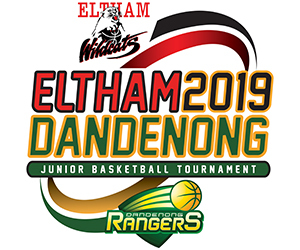 We would also like to thank David Way – Frank Knight Valuations, David Greenberg – Aussie Basketball Travellers and all the Staff at Eltham Wildcats for their support in making this happen.